Admittedly, I have been on a bit of a paper piecing kick lately. I agreed to design a block for a garden party themed blog hop next month, see here for more details. I have my block all ready to go and enjoyed designing it so much that I thought I might make more garden designs. If you have read my blog for any length of time, you know that I love gardening as much as I love sewing. So, it’s the perfect fit. 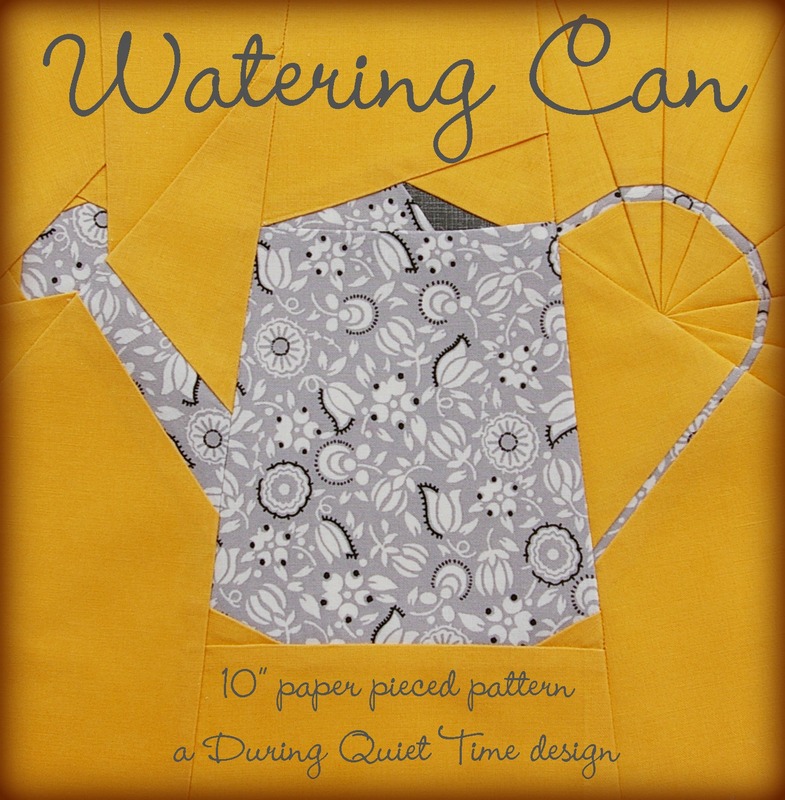 I just finished designing this 10″ paper pieced watering can. Since it has the feel of an old metal can, I used Vintage Notions from The Dressmaker’s Collection by Amy Barickman for Red Rooster Fabrics, a treat sent to me by Kristina of Quilted Treasures. Don’t let her Etsy shop fool you, her shop has over 3000 plus bolts, just not everything is listed on Etsy. Feel free to convo her, tell her I sent you, and let her be your personal shopper. She loves that! I think that the solid I used for the block background is Ochre Kona but I am not a hundred percent sure. I really need to get myself a Kona color card! I made my first sample block of this design with a text print from Lakehouse for the watering can and Elizabeth’s Letters by Jill Finley of Jillily Studio for Henry Glass Co. for the background. Both are older prints. 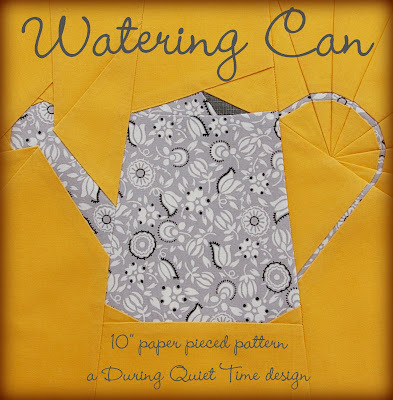 I love how these fabrics worked for the watering can and spent a lot of time lining up the text just so along the handle and the “Guaranteed to Grow” bit at the top of the spout. I also fussy cut the blue background so that the little flower rested inside the handle. But when I was finished, I realized that the block really lacked contrast. The spout, in particular, blended in with the background as did the bottom of the can. So I decided to try to rectify it with quilting since I couldn’t stand to toss it. Of course, I never thought to take a before picture but the quilting worked wonderfully! I used a very dark contrasting brown thread and held my breath while trying to quilt ever so slowly in the ditch. It almost creates a tiny shadow, just enough to define the watering can and make me happy. I combined it with Essex Natural Linen and some Hometown to make a pillow, finished off with my favorite invisible zipper in beige. If you would like the pattern, this one is in my shop.